Preheat the oven to 375. Butter and flour or spray with cooking spray with flour a 9-inch springform pan. In a medium bowl, whisk together 2 cups of flour, baking powder and salt. Set aside. In large mixing bowl, cream together butter and sugar until fluffy. Beat in the egg and vanilla. Add the flour mixture alternately with the milk, beginning and ending with flour until a thick dough forms Pour batter into the prepared pan. Thoroughly spread the cake with the compote. Set aside. In a small bowl, mix together all of the streusel ingredients by hand or with a fork until a rough crumb forms. 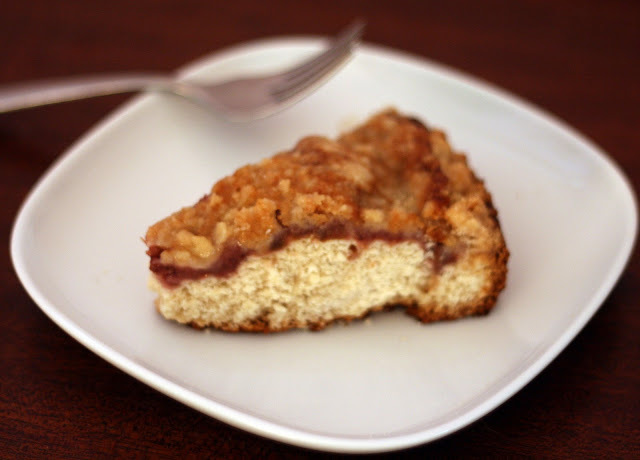 Sprinkle streusel evenly over the compote-topped raw cake. Bake 40 minutes or until a toothpick inserted in the center comes out pretty much dry. Remove to a wire tack to cool. After about 15 minutes, release the buckle from the pan and serve. Rhubarb is finally in season and compote-ing is a great way to sweeten up some not quite in season strawberries. Combine that compote in a sweet cake and there is no stopping you. No stopping you! Take over the world, one breakfast at a time.